Eight-story building sharing same tax lot as Plaza Hotel was included in 1969 designation. 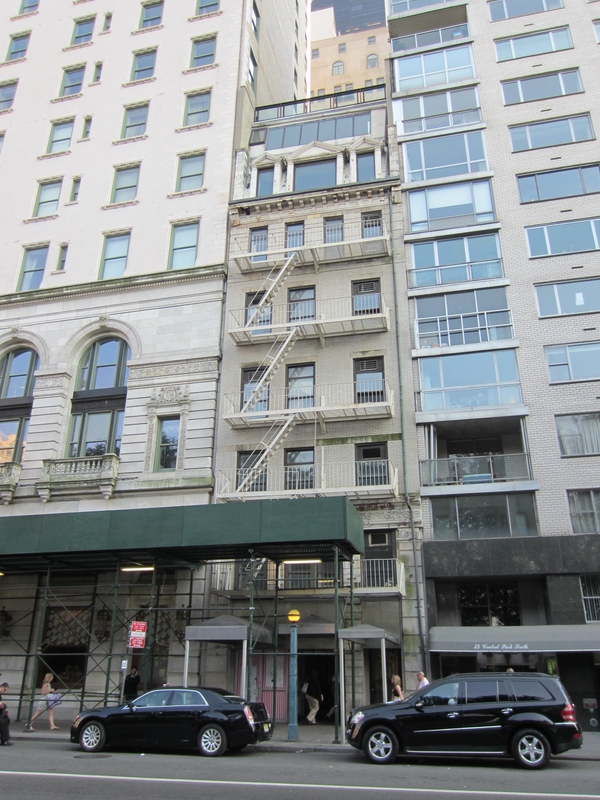 On June 19, 2012, Landmarks approved a plan to rebuild the facade of, and build a rooftop addition to, an eight-story building at 22 Central Park South. The building was constructed in 1897, and was substantially modified and enlarged in 1909. It abuts the western wall of the individually landmarked Plaza Hotel, and was included in the 1969 landmarking of the Plaza Hotel because it shared a tax lot with the hotel at the time. At the hearing, Landmarks Chair Robert B. Tierney termed the building an “accidental landmark,” noting that it was not mentioned in the 1969 designation report. Historic preservation consultant William Higgins, speaking on behalf of the owner, explained that 22 Central Park South shared the same tax lot with the hotel from 1965 until 1980, and claimed the proposal was before Landmarks as an “administrative technicality.” Higgins said the building had undergone significant changes since its 1909 enlargement; gaining a subway entrance, a rooftop addition, and a fire escape. According to Higgins, the Plaza Hotel acquired the property in 1915, but never physically incorporated it into the hotel. Instead, it was leased to commercial tenants or used as administrative offices. Architect David West, of Goldstein Hill and West Architects, said the proposal intended to create a “well-proportioned, tasteful building that respects its comrades.” The building’s brick facade would be replaced with limestone and a granite base. The fire escape would be removed and windows would be replaced. The entrance to the building would be moved, and the subway entrance would be lined with limestone. A set-back ninth-story addition would be partially visible from Central Park South and from some Central Park vantages during the winter. West said the proposal’s design and materials were inspired by, and would comport with, the surrounding buildings. Howard Mendes, representing Manhattan Community Board 5, supported the proposal, stating that it would be “a major improvement over what’s there.” Representatives from the Historic Districts Council and the Society for the Architecture of the City argued that the plan should incorporate more of the existing fabric and refrain from demolishing the entire front facade. Commissioner Fred Bland said the redesigned building would fit in with the “elegance and classicism” of Central Park South. Commissioner Libby Ryan said the building’s “accidental landmark status” justified allowing significant changes to the building and found that the proposed materials would not “fight” with the Plaza Hotel. Commissioner Margery Perlmutter found the proposal appropriate, acknowledging that the building’s “so-called accidental landmark status” persuaded her to support the project. Commissioner Michael Devonshire was reluctant to characterize the building as an “accidental landmark,” and while he did not consider the proposal elegant, he found that it would enhance the Plaza Hotel. LPC: 22 Central Park South, Manhattan (13-1299) (June 19, 2012) (Architect: Goldstein Hill and West Architects).